a declaration of dependence | Have You Accepted Cheeses As Your Personal Flavor? We Americans crave our independence. The political freedom we’ve been given, few of us have earned. Yet our freedom has produced a sense of entitlement to liberty in all areas of life. We expect to be able to choose between the best options at all times. Our preferences become our truth. We want to do what we want to do, when we want to do it, how we want to do it and why we want to do it. While I’m very grateful for our political freedom, I fear this mentality carries over into our faith and can be very damaging. The problem is, God is calling us to dependency. In the garden, Adam and Eve ate from the Tree of Knowledge of Good and Evil. After this deadly choice, they began to live by their own knowledge of what was right (good) and what was wrong (evil). They began to use their own human wisdom and substitute their ideas for God’s ideas. Their newfound independence lead to sin, hiding from God, and eventual death. If you think about it, the root of all sin is independence from God. When we lust, we are basically saying God cannot fulfill our needs so we must grasp for fulfillment ourselves. Those who steal aren’t willing to let God provide for them. Pride declares that we are good enough without God. All of this is nothing more than mankind asserting his independence from God. The church has to learn to be dependent again. We must be dependent on God as our Savior, Father, Comforter, Healer, Defender, Teacher and Provider. But it’s not easy. In Matthew 18:1-4 Jesus told His disciples that those who become like children are the greatest in the Kingdom of God. In the past I’ve understood this to mean that we must be willing to believe anything just like a child does. While that’s true, I think it more likely speaks to the point that we must depend on Him like a child. A child is completely and totally reliant on his parents for everything – from the natural essentials like food, clothing and shelter to the emotional needs like love, care and affection. In the same way, we must stop the routine of relying on ourselves and turning to God only in emergencies. This relationship is shallow at best. We must train ourselves to live a life dependent on Him. I am very thankful for the freedoms that living in United States affords me. However, I don’t ever want my natural independence to infiltrate my heart and affect my spiritual dependence. I want to completely rely on, trust in and cling to Him above all else. 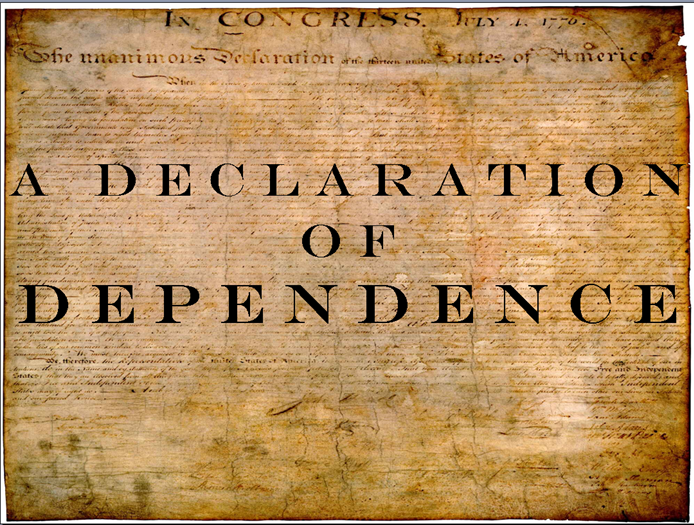 This July 4th weekend, as we celebrate our country’s political freedom and remember our nation’s Declaration of Independence, I encourage you to join with me and we will make our own declaration of dependence and proclaim that we are totally, completely and utterly dependent on God alone.